Air Compressors Direct Lists Best Contractor Twin Stack Compressors. Recommendations Based on Sales History and Expert Reviews. The portability of twin-stack compressors is great because you don't have to run air hoses everywhere and you can easily throw it in your truck as you go from site to site. Today Air Compressors Direct announced its recommendations for the best contractor-grade twin stack air compressors. "Contractors and building professionals expect a lot from their equipment, and these twin stack compressors fit the bill," said Steve Robbins, resident product expert at Air Compressors Direct. "Their portability is great because you don't have to run air hoses everywhere and you can easily throw it in your truck as you go from site to site." According to Robbins, most retailers are loyal to whatever compressors are on their shelves. However, AirCompressorsDirect.com, isn't your ordinary retailer. The online superstore specializes exclusively in air compressors and carries eleven contractor twin stack air compressors from the leading national brands. 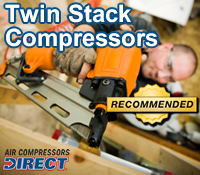 Once the dust and data settled, only 3 twin stack compressors sold by AirCompressorsDirect.com were given its prestigious "Recommended" status. In addition, Robbins personally wrote online reviews for each contractor twin stack compressor, explaining why the company recommended it. By providing the recommendations and reviews, Air Compressors Direct hopes to arm shoppers with enough ammunition to pick the perfect contractor-grade twin stack air compressor for their needs.